Welcome to our online candy shop - our personalized and non personalised sweets &candy range will make any candy bar or sweets buffet table special. For birthdays, parties, weddings, our personalized rock candy and custom made personalised lollipops are special. We also sell cheap sweets & confectionery such as chocolates and candies for a very affordable price - order online for rapid delivery. Our party sweets for sale online and in our store are great for filling decorative candy jars, as well as our lolly bags and lolly boxes, and birthday party sweets tables. We deliver Australia wide from Melbourne, Australia. All the candy, sweets and lollies you can eat! Nothing says a party like bowls and bowls of lollies and sweets! Grown ups enjoy childhood memories of mountainous peaks of candy and plates of fairy bread piled high. As specialists in custom-designed and personalised party supplies our candy completes your celebration – no matter what the occasion. Sophisticated Sweets or Lovable Lollies? Got a kids party coming up? Want to leave a lasting impression on your guests? Why not match your custom custom birthday banners with personalised candy, lollipops and birthday balloons? Choose from photo and non-photo designs, personalised or non-personalised candy and lollies – we have them all! We can customise your custom edible images, bunting, lolly bags and more with the one design to create a unified look. Want to get creative for your wedding? Filling candy jars with personalised lollies and chocolate beans is a wonderful way to add a personal touch to your wedding reception. Love jellybeans? Looking for candy for weddings? We've got a gorgeous selection of multi-coloured mini jellybeans to choose from as well as personalised cookie favours gumballs, fairy floss and more! Add some fun to your wedding candy look with some personalised colourful candy treats. We love to work with your ideas for inspiration on creating fabulous colour combinations or themes for parties. Do you have favourite colours you want to dress your party tables with? 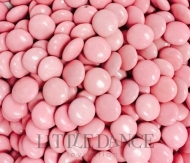 Or perhaps you want to match your baby shower invitations or reveal the baby's gender with some blue or pink gumballs on the tables? Want to keep your guests guessing? Why not jars of lemon and green coloured jellybeans? Whatever your plans, we'd love to help coordinate your candy so that you get the dream celebration you want. Our rainbow-inspired range of personalised lollipops,custom rock candy designs and personalised chocolate bars are as good as they look. If you or your friends have a sweet tooth, then these are the treats for you! Browse online or give us a call to chat about your party needs and we'll help! Do you sell confectionery online as well? Shop for your candy and sweets online. We deliver our personalised candies and lollies anywhere in Australia from our studio workshop in Melbourne. Shop onlinefor a speedy delivery turnaround, or call our friendly customer service line and we'll help you explore our designs and offer advice on our products. We can also help with all your party invitations needs, including kids party invitations, baby shower supplies, or your ownwedding invitations. Give us a call or contact us online today!